A new book looks at this fascinating part of Irish history. ACHILL ISLAND LIES in the west of Ireland, off County Mayo. With its mountains, cliffs and beaches, it was a tough place to live in the past. In pre-Famine Ireland, the island drew in a preacher who tried to reach the locals with his religious fervour. Called Reverend Edward Nangle, he grew his proselytising mission by setting up the ‘Colony’ at Dugort on the island in 1832. He colony included cottages, an orphanage, schools, and an infirmary, and drew visitors from across the world. But Nangle’s mission drew ire from the Catholic Church at the time, most notably from John MacHale, the Archbishop of Tuam, who spearheaded the fightback against him. Now the fascinating story of the Achill Mission is told in a new book by Patricia Byrne, titled The Preacher and the Prelate: The Achill Mission Colony and the Battle for Souls in Famine. The book sounds like it could be fiction, and indeed it’s written in a narrative style that brings to life the story of Nangle and his mission, and the impact of his choices on his wife Eliza and their family. On a winter’s night, 6 January 1839, a woman listens in the darkness of her mountainside home. The wind strengthens by the hour; it is more terrifying than any island gales Eliza Nangle has experienced in five gruelling Achill winters. Her husband is absent, away on important engagements, for he must travel to raise funds for the Achill Mission’s work and for the family’s survival. Perhaps her three small daughters rush to her for comfort as successive squalls roll up the mountain, Slievemore, to a screaming crescendo. Byrne says the story of the Achill Mission fascinated her from the moment she first heard about it, while away at a Heinrich Boll arts weekend on Achill. “It’s extraordinary, that on such a small area like Achill all these things like famine, religion, agitation, land, eviction, imperialism – all those big issues [combine],” says the Mayo-born writer. The book was quite an undertaking, she says. To begin her research into Nangle’s time on the island, she began to walk around the places he spent time in Achill. The remains of the colony still exist beneath the shadow of Slievemore. Nangle was part of the extreme evangelisation movement, explains Byrne. He was gifted but prone to what might have been manic episodes. He started the monthly journal the Achill Missionary Herald, and was editor for almost 40 years. This was an important source for Byrne, alongside newspapers and folklore. That there was “an amazing number of travellers” who visited the Achill Mission, and recorded their thoughts about their journeys, also helped. Many of the travellers were women. At the core of the book is the fractious relationship between Nangle and Archbishop MacHale. The pair may have been diametrically opposed in many ways, but they were “both very similar in terms of skills and characteristics”, says Byrne. The book also focuses on the hardships experienced by Nangle’s wife, Eliza Nangle. She was the mother of three small girls when she first arrived with her husband on Achill. But in her first three years on the island, five Nangle infants died. Eliza died before she was 40. She is buried with her five children and an adult daughter on the slopes of Slievemore. Her husband is buried in Monkstown alongside his second wife. Edward Nangle was inspired in his work by a Scottish clergyman called Christopher Anderson, who came up with the idea of converting people through their native language. Anderson was doing this in very remote places, and Nangle decided he would try to do similar in Ireland. He went to the West with a relief ship of provisions during a famine in the 1830s, and then went on to Achill in 1831. He got land from a landlord on the slopes of Slievemore and began to build the colony. “He arrived just as John MacHale became archbishop of Tuam – almost from the beginning there was an antagonism,” says Byrne. 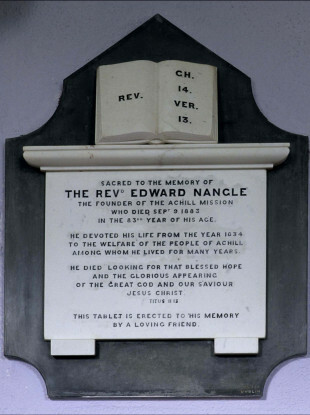 During the Great Famine, Nangle got involved in feeding the children who attended his schools. This caused issues as Nangle’s efforts were part of his proselytising. He was accused of “souperism” – giving relief in return for a change of faith. This led to his notoriety, says Byrne. At the heart of the story is the question: Did Edward Nangle and the Achill Mission Colony save hundreds in Achill from certain famine death, or did they shamefully exploit a vulnerable people for religious conversion? For some, the Achill Mission has left a legacy of hurt, but Byrne says that people today are trying to heal the wounds. Around five years ago, local Catholic and Protestant communities got together for a healing ceremony. At St Thomas’s church in Dugort, they erected crosses for people who converted during the Famine but were buried without headstones. The Achill Mission was in decline by the 1870s, and eventually petered out. But its story and legacy remain fascinating to this day. In her book, Byrne tries to work out what the story means to her. “For me it was really like going back into my history, it was very dramatic, a very dramatic writing journey,” she says. The Preacher and the Prelate is published by Irish Academic Press and out now. Email “The fascinating story of the Achill Island preacher, the Famine, and the Prelate ”. Feedback on “The fascinating story of the Achill Island preacher, the Famine, and the Prelate ”.